By the time you reach this page I will assume you are already familiar with the current events (no pun intended) surrounding Packery Channel. Nueces County is sponsoring a bond issue this year (1999) to reopen what has historically been one of several natural passes between Corpus Christi Bay and the Gulf of Mexico. This tutorial is about Packery Channel. It isn't about whether it will fill in, how much will it cost, or what will it do to the tax base. The question I want to ask as we study this subject is "do we understand what we're doing"? The short answer is "no". The longer answer is the point of this tutorial. W. Armstrong Price, the god-father of Texas coastal geology, pointed out a half-century ago that our shorelines are both ephemeral and young. Padre Island is barely 5,000 years old. The Aransas Pass inlet led to a mudflat when the precursors of today's cities sprang up in South Texas a century and a half ago. Packery Channel, what used to be called Corpus Christi Pass, has opened and closed several times in the last 150 years. In between these points in time, the shifting sands and fluctuating sea levels of the western Gulf have alternately created and destroyed innumerable coastal features. Passes come and passes go. Over a timespan of decades, the barrier island chain itself writhes and contorts like a toddler strapped into a car seat. When Europeans first arrived in South Texas, they fully understood that breeches in the barrier island were as fluid as the water plowing through them. A sailing ship bound for Philadelphia might exit the bay through Packery Channel and return through Newport Pass only a few months later. During our relatively brief tenure on the Texas coast we have seen Packery Channel open and close several times. The last and most final coming after the permanent opening of Aransas Pass early in this century. We can see some of these features when we look at the work of early surveyors. The earliest high quality map of Corpus Christi Bay dates from 1859. 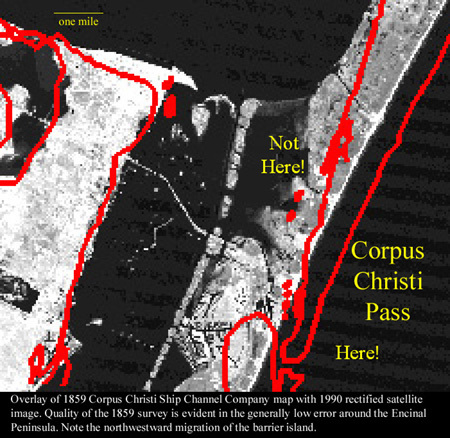 The map (whose outlines are shown here in red) was produced for the Corpus Christi Ship Channel Company. It depicts the then dominant opening of Corpus Christi Pass on the southeast corner of Corpus Christi Bay. Using a process called image rectification, myself and one of my graduate students, Mike Villarreal, plotted this 1859 map on top of a modern satellite image of the area. The results are unmistakable - What we call Packery Channel today is what 19th Century mariners dubbed Corpus Christi Pass. 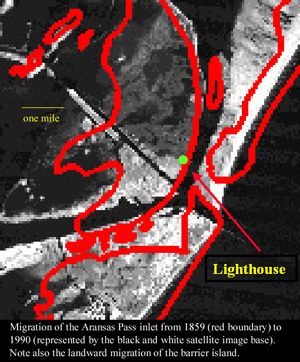 Also demonstrated by this technique is the southward migration of Aransas Pass which occurred before that opening was stabilized earlier this century. For details of this study, see the on-line presentation Maps and Myths. As shown in the image overlay above, the shores of Padre Island in the vicinity of Packery Channel have migrated almost 3/4th's of a mile to the west (towards the mainland) since 1859. When we combine what we can measure with what we know about barrier island dynamics, the message is clear: The barrier islands of Texas are geologically slippery. They look stable, but only because we haven't been looking at them long enough. Regarding anything on the islands as permanent as a mistake. As any old-timer can testify, the barrier islands change every time a hurricane blows in. Hurricane washovers pick up sand on the seaward side of the island and deposit it on the laguna side. Over time the island marches towards the mainland. This process has already been completed for Flour Bluff and the Ingleside Strand Plain…these areas were parts of a prehistoric barrier island which graced out coast during the last glacial high stand about 120,000 years ago. If the islands are fluid, the same holds true for the passes and channels which cut through them at various points. There is a classic Three Stooges sketch in which Curly (or maybe it was Moe) encounters a bedroom chest of drawers in which the top drawer is open. As he slams it shut, the bottom drawer pops out and bangs his shin. When he bends over to close the lower drawer, the top one flies out and hits him in the head. This is not a bad description of how channel developments occur along the Texas coast. By forcing Aransas Pass to remain open (through continuous dredging operations and reinforced jetty openings) we force the other channels like the Fish Pass and Packery Channel to remain shut. The tidal energy which once scoured them is funneled through Aransas Pass instead. The understanding which seems to be missing from the Packery Channel debate is that the barrier island chain we call Matagorda, St. Joseph's, Mustang, and Padre Islands is nothing more than a foam of sand and shells hurled against the coast by the changing fortunes of wind, wave and sediment supply. As you open one breech, nature will rush to close another. Left to their own devices, the boundaries between these islands, what we call channels, come and go with astonishing regularity, like the comedy drawers opening and closing. Scientifically, this is called a dynamic equilibrium. Everything changes but the net result, a barrier island chain along the Texas coast with some passes here and there, remains. At least that is the way mother nature operates. With the damming of the Rio Grande and other major Texas rivers during the 20th century, the sediment supplies which built these barrier islands have been strangled. Coupled with dubious engineering feats like the seawall in front of the Padre Island hotels, the result has been a steady erosion and destruction of Texas beaches. This accelerated erosion makes the past behavior of barrier islands a poor indicator of future dynamics. With the advent of artificially maintained permanent channels such as the one at Aransas Pass, humans have managed to disrupt that dynamic equilibrium and force nature into a decidedly unnatural condition. Can we do the same for Packery Channel? At this point it should be obvious that, given enough money, our engineers can answer this question with aplomb. How nature will respond is another story altogether. In the end, I submit, it doesn't matter what the engineers propose or how nature responds. Current events (no pun intended) will lead to a logical conclusion. The county bond package which was defeated in 1999 was going to give us a double dip of environmental interference. Not only do we dredge Packery Channel and open the Laguna Madre to the ocean, but we raise the JFK causeway at the same time. The result, is to guarantee a manipulation of water circulation between the open Gulf and the northern end of the Laguna Madre. The effects of this restored water exchange are poorly understood. Gordon Gunter realized the magnitude of these variables as early as 1945. In modern times, Richard Watson has likened it to connecting a bathtub to a swimming pool with a soda straw...too narrow, too shallow, and too crooked to make much of a difference. Early in this century, in the days before any causeways or canals, my father and his brothers waded across the Laguna Madre for a weekend fishing trip on the island. That first night, after a full day of hiking and fishing in the dusk, they bedded down on the north side of Packery Channel. About midnight, the story goes, a last quarter moon rose over the Gulf. Almost simultaneously they were awakened by a continuous clapping roar. The sound was like applause from a thousand hands at the end of opera. Increasing in both volume and tempo, they realized the crescendo was coming from the water in the channel. In the slanting moonlight they looked out to see the source of the cacophony; shrimp climbing over one another, clicking and slapping, as they rushed, by the millions, out into the Gulf. The water was barely a foot deep. The current was almost non-existent. The shrimp didn't mind. This was one of the last times that the ecosystem around Packery Channel was pristine. Humans, in the meantime, have a long history of ignoring the spectacles of nature and doing things to the environment that we do not understand. Clearly the folks who promoted the permanent opening of the inlet at Aransas Pass didn't understand the effect it would have on Packery Channel, Newport Pass and other ephemeral features. But they did at least understand that their action would help create the Port of Corpus Christi. There were major long-term economic ramifications of their action. They understood these and were prepared to spend millions of dollars on a major engineering construct which would require decades of routine maintenance. The payback was clear. The same cannot be said for Packery Channel. Yes, it will raise some property taxes and yes, the folks with boats will enjoy the shortcut. Beyond that, we are hard pressed to explain exactly WHY we want to do this. We know now that the permanent opening of Aransas Pass effectively closed Packery Channel and with it the free circulation of water from the northern Laguna Madre into the Gulf. The additional construction of the causeway in the mid-20th Century closed off the already meager water exchange between the northern Laguna Madre and Corpus Christi Bay. And, as my father was fond of pointing out, he brought me into the world and was, by god, he was entitled to take me out again. The same can be said of the northern Laguna Madre today. The environment we see around Packery Channel today is a human creation. Perhaps we have some sort of right, even obligation, to restore that environment to what it was before we started fiddling with mother nature. But really restoring Packery to a natural state, performing a so-called "ecosystem restoration", is not a serious option. Yes, it would be easy enough to tear down the adjacent seawall and limit the type of construction in the area, but no, it is not realistic to think that we are going to shut down Aransas Pass and restore the natural water circulation patterns. That leads us to a decision point. If we aren't going to restore Padre Island to it's pristine condition, then let's forget the environmental mumbo-jumbo altogether. Let's assume that we don't really care about what happens to the environment of the northern Laguna Madre. Let's pretend that we don't care about the seagrass beds or the fish nurseries they harbor. Let's ignore the economic benefits that flow from sport fishing and eco-tourism. Let's just talk about how to make money from Padre Island. Let's go ahead and fix something which is not broken. Like a teenager, just to see what happens. When I was boy, growing up in Corpus Christi, my mother tutored us that the people who lived on Ocean Drive were idiots. Anyone stupid enough to live on the water, she claimed, deserved whatever happened to them. This may sound brutal but it was considered to be a fact by the locals. And not without a reason. The City of Corpus Christi has effectively been destroyed or maimed three times in this century, during the hurricanes of 1916, 1919, and 1970. That was why (no rocket science here) virtually nobody lived on the island. Yeah, there were the folks in Port Aransas, but they were a self-sufficient lot of fishermen and beach combers who built their homes on stilts behind the dune line. Normal people did not live on the island. But that all began to change by the 1970's when developers realized that people actually LIKE to live near the water. Federally-promulgated insurance finally made disposable housing an economic reality. You could live the island dream and not worry about going bankrupt when (not if) your home was destroyed by the next big storm, because federally subsidized insurance protected you. The result is what you see today. We have gone almost 20 years without a major storm, 30 if you ignore Hurricane Allen. Development on the island has mushroomed during this protective window of time. There are now enough people and enough infrastructure that we actually hear serious calls to raise the causeway for the protection of life and property. After all, it's pointed out, "Who would want to live here if 6,000 people got trapped and drowned in a hurricane?" Who indeed? The answer seems obvious. Raise the causeway. Dig the channel. Develop the island. Now if developing the island is your goal, there is no better engine than the double whammy of raising the causeway and re-opening Packery Channel. The easy access to the Gulf will bring in more people and more houses. More people will mean more political clout. That clout will raise the causeway. Those people will bring infrastructure with them; grocery stores, shopping malls, theatres. It does not take a visionary to recognize that the simple act of re-opening the channel and raising the causeway will allow North Padre Island to rapidly eclipse South Padre Island as a tourist mecca and retirement haven. It's easier to get to and, for now anyway, cheaper. And you know what? That's not such a bad idea. The island environment is unique and seductive. I've enjoyed it for most of my life. Why be stingy? Let other folks share in the beauty of a Gulf sunrise, the whip of salt spray around their ankles, the thrill of landing a bull shark from the surf. And as we share that idyllic lifestyle, all the folks moving to the island will pay huge property taxes on their fancy homes. Taxes that don't have to be paid by the rest of the residents of the county. Maybe Judge Borchard does have this figured out after all? Oh sure, we lose a singularly pristine environment in the process, but hey, if you want pristine environments, there's a whole national seashore just down the road. A seashore forever protected from our capitalist greed. Looks like a win-win proposition to me. Whether now or later, all of this will happen. The raw fact is that, barring a modern plague, human population will continue to grow. The U.S. population will grow with it. In our modern age of personal mobility, snowbirds and other landlubbers will descend upon our coast for the very reason we stay here. The lure of the sand and the freedom of the sea are powerful magnets for humans. Indeed, a strong ecological argument could be made for putting everyone out on the island; thereby freeing up the productive soil of Nueces County for rich cultivation of crops for food and fiber. The island, after all, is mostly about the beauty of the seashore - take away the water and all you have is a hot strip of sand filled with cactus and rattlesnakes. And the island, like the people on it, is ephemeral. But as we dredge the channel and raise the causeway, we need to remember our original question: Do we understand what we are doing? In particular do we understand the ramifications of encouraging people to move onto the island? Do we know what we're going to do when (not if) the next big hurricane bears down on us? Riding out the storm from home is a time-honored tradition on the mainland - it is not an option on the island. The astute among you will point out Port Aransas as a counter to my argument. Port Aransas has been on that very island for decades and people there have routinely ridden out storms with fairly minimal loss of life or property. Right? Right indeed. But look at the old buildings in Port Aransas more closely...the ones that have survived past storms. Unlike most of us, the fishermen and beach bums who built Port Aransas did understand what they were doing. Homes were built on stilts or piers, businesses were built on tall pilings - all of them behind a high wall of well-nourished sand dunes. Windows were kept small and shuttered from the direct impact of storm tides. We, on the other hand, blithely build our new island homes as if we were on the 18th fairway of a golf course in Dallas. Look at a new home on Padre Island today. Ground-level slabs and walls with view-inspiring expansive glass walls are the order of the day. Those homes and businesses will be destroyed in the next big one. And the next big one will be worse than any we have seen in the past. Sea Levels have already begun to creep upward in what appears to be a response to global climate change. There is no extant scientific evidence to indicate this will change during the life of a new 30-year mortgage. Storms will become more, not less, severe. A home built to withstand 20th century storms may well become 21st century flotsam. But there is an alternative reality. Functionally, socially, and scientifically, we have more in common with the dawning 21st Century than with the waning 20th. All of our lessons about headlong development and progress at any cost are now subject to closer examination. There is a possibility, just a possibility, that we may choose to look at the heritage of our land differently. To ask questions about values other than the economic. To pause and take seriously our own counsel when we realize we are doing things we do not understand. "Next morning at the same hour we lay in wait beside an ordinary-looking slough, its bars covered with goosetracks. We were already hungry, for it had been a long tramp from camp. My brother was eating a cold roast quail. The quail was halfway to his mouth when a cackle from the sky froze us to immobility. That quail hung in mid-air while the flock circled at leisure, debated, hesitated, and finally came in. That quail fell in the sand when the guns spoke, and all the geese we could eat lay kicking on the bar. More came, and settled. The dog lay trembling. We ate quail at leisure, peering through the blind, listening to the small-talk. Those geese were gobbling gravel. As one flock filled up and left, another arrived, eager for their delectable stones. Of all the millions of pebbles in the green lagoons, those on this particular bar suited them best. The difference to a snow goose, was worth forty miles of flying." Leopold recognized fifty years ago what many of us are still grappling with; that nature is infinitely complex and that most of it remains to be discovered. Like Leopold and his geese, we have much to learn about the workings of Padre Island and the Laguna Madre. If all of this makes your head hurt, don't dispair, we can begin the century the easy way. We can ignore the environmental lessons, learned at great pain, over the past 50 years. We can treat Packery Channel like our grandfather would have. Just dig it. Miami has done this with great economic success. South Padre Island has emulated this path as well. It would be easy for Nueces County to follow suit. Be a cowboy, not an indian. This is a known; the other, an unknown. The alternative will be much harder. We can recognize that, like the perfect little stones sought by the geese, there is much to learn about understanding our little corner of the world, our laguna and our island. We can see that the quality of our life by the laguna is more important than increasing the tax base or having a short cut into the Gulf. We may even envision a future in which the natural beauty and wildlife of South Texas is what we sell...not just a few lots on the island reserved for folks who don't know or don't care what they are doing. Then, perhaps, we will have made a decision to make our grandchildren proud of being South Texans.